WASHINGTON (AP) — One after another, landmark U.S. protections for climate, air and land are in the crosshairs of the Trump administration as his agency leaders move past early fumbles and scandals to start delivering on a succession of promised environmental rollbacks. On Thursday, the Interior Department proposed easing rules on oil and gas drilling for millions of acres of range in the West. And as soon as next week, the Environmental Protection Agency is expected to unveil its proposed rewrite of a major 2015 Obama rule that extended federal protections to thousands of waterways and wetlands. Supporters and opponents expect the overhaul of the national water rule could go even further, also changing aspects of how the U.S. enforces the 1972 Clean Water Act, one of the country's foundation environmental measures. Environmental groups say the rewrite could lift federal protections for millions of miles of streams and wetlands in the lower 48 states. The broad outline of the administration water rule to emerge so far points to "an unprecedented rollback of Clean Water Act protections," said Jan Goldman-Carter, senior director of wetlands and water resources at the National Wildlife Federation. The pending water rule changes and other major rollbacks already announced give big wins to energy companies, farmers, builders and others who've fought for decades against environmental rules they see aimed at stalling or stopping projects until developers give up. "This is what's being done in the country to stifle...progress. President Trump is very aware of this," said Myron Ebell, a director at the Washington-based Conservative Enterprise Institute who led President Donald Trump's environmental transition team. Maybe crucially, this month's complex overhauls of major environmental rules are associated mainly not with the high-profile political figures that Trump appointed as Cabinet heads for Interior and Environment, but with both men's deputies, who are Washington veterans and technocrats. At EPA, now acting Administrator Andrew Wheeler was named to succeed Scott Pruitt, whose own, more hastily announced environmental rollbacks have been mired in legal challenges since scandals over spending helped drive Pruitt from office in July. At Interior, Deputy Administration David Bernhardt had worked on easing the sage grouse protections hindering oil and gas drilling, and as a lobbyist for oil and gas previously. His boss, Ryan Zinke, remains in office but is battling to regain Trump's favor amid ethics investigations. Ebell, the former Trump transition team figure, said the administration could be rolling back environmental rules even more quickly if it had moved faster to fill leadership teams in federal agencies. "Dysfunction in the White House personnel process has really slowed them up, but they are starting to make some progress now," he said. A set of White House talking points for the proposed new water rule obtained by the Associated Press says the Trump administration would remove federal protections for waterways including isolated wetlands and ponds and creeks that run only after rain or snowmelt, among others. Up to 60 percent of the stream miles in the continental U.S., not counting Alaska, and more than half of the wetlands appear to potentially be affected, Goldman-Carter, with the National Wildlife Federation, said. The overhaul, commanded by Trump in a 2017 executive order, deals with what kinds of waterways fall under protection of the Environmental Protection Agency and the U.S. Army Corps of Engineers. Environmental groups say more than a half-century of federal preservation of even remote, unloved and at times bone-dry creeks and wetlands has helped protect major downstream lakes and rivers from upstream pollutants, fertilizer runoffs and oil spills, helped clean up big water bodies including the Chesapeake Bay, and helped buffer humans against droughts, floods and hurricanes. Many farmers, miners, builders and others loathe the federal protections for remote creeks and seasonally dry frog ponds, seeing the water protections as unjustified federal barricades to plowing or building on their own private property. 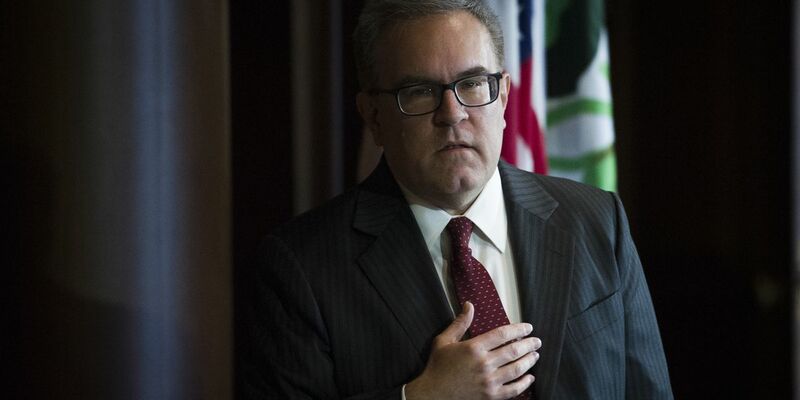 "The previous administration's 2015 rule wasn't about water quality," the White House's talking points say, making an argument that the EPA's Wheeler has echoed in meetings around the country on the pending water proposal. "It was about power - power in the hands of the federal government over farmers, developers, and landowners," the unreleased administration statement says. The administration is acting to grant other prayers of businesspeople who think U.S. environmental laws go too far. On Thursday, the administration moved to further open up for oil and gas drilling 9 million Western acres that conservationists are vital for native species, including an imperiled bird. Other rollbacks late this summer targeted what had been legacy Obama efforts to combat climate change by reducing coal, oil and gas emissions from the nation's electrical grid and passenger vehicles. Many of the rollbacks put in motion aim to prop up the declining U.S. coal industry. That includes one Wheeler announced Thursday for new coal plants. Farmers, utility executives and a host of others will wait to see if Trump wins a second term to make the rollbacks take hold, Ebell said. Democrats taking control of the U.S. House next month hope to try to stop the loss of ground, and even gain some. Rep. Frank Pallone, a New Jersey Democrat expected to chair the Energy and Commerce Committee under Democratic control, said in an interview he will include climate-change projects in big infrastructure bills he hopes can gain Republican support. "We want aggressive action" on it, he said.